Product #17664 | SKU 3950 | 0.0 (no ratings yet) Thanks for your rating! The Hensel Strobe Wizard Plus Radio Slave System combines radio triggering, model light activation, and flash power control into one single compact device ( with Hensel strobes that support these features ). The availability of 3 channels prevents interference between different work groups within the same studio. On channel #4 (master channel) all devices can be controlled simultaneously, regardless of the channel they are set to. In addition, this improved Plus version has a maximum sync speed of 1/250th. The transmitter is small, light and easily mounts into a hot shoe. In addition, it also comes supplied with a short sync cord (sub-mini connection) for PC sync connection. This system supports the possibility of remotely adjusting flash power and activating the modelling light via the Up/Down buttons on heads equipped with built-in receivers. A maximum sync speed of 1/250th second allows for shorter flash durations. Protected by a solid plastic housing. 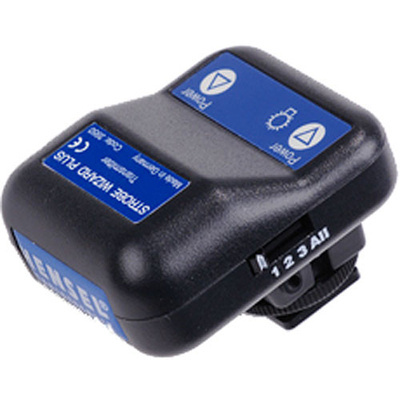 A low sync voltage makes it ideally suited for digital cameras. Receiver has 1/4" (6.3 mm) phone plug.